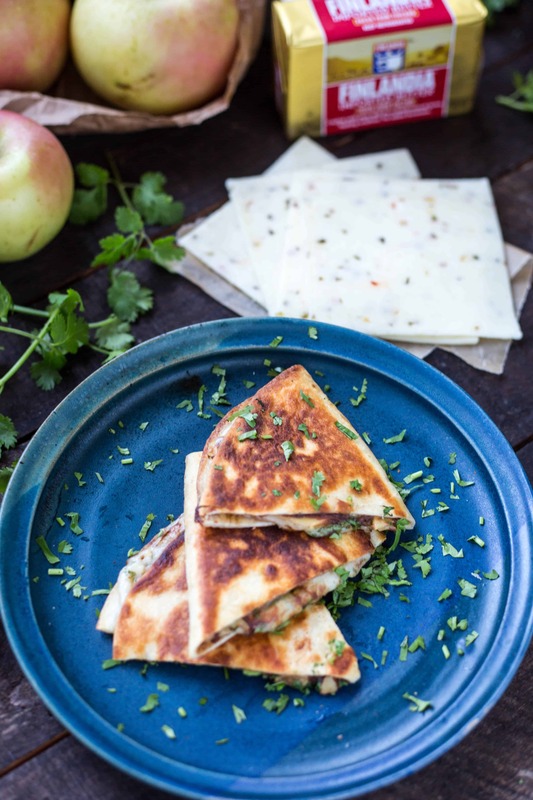 This quick and easy recipe for Apple Butter Quesadillas is a sweet, salty, and completely addictive snack. Only a few ingredients and perfect for adults and kids alike! I can’t help but laugh at this recipe. If you told me 10 years ago that one day I’d be posting it up on my weekly food blog, I really would have laughed. You see, I came up with these quesadillas back when I was in college and not… uhh… totally sober. I used to love getting into the kitchen after a night of partying (and full disclosure: still do). One night, while totally slightly inebriated, I whipped up a concoction using whatever my roommates and I happened to have in the fridge: tortillas, pepper jack cheese and apple butter (the cilantro came later). We all kind of assumed this was going to be terrible, but also didn’t care because we were desperate and hungry. But! Turns out, it wasn’t terrible. Far from it, actually. They actually tasted pretty darn good. And not just because we were all drunk on cheap beer. They tasted good because the combination of flavors straight up worked. Buttery, sweet, salty, spicy, crunchy, cheesy. We had ourselves a winner, and I felt like a mad genius. After that night, we made these quesadillas all the time, and this simple recipe has continued to be a staple well into my adulthood. I guess it’s about time I shared it with YOU! As an adult, I find these are even better when made with top-quality ingredients. I’ve made them using my cousin JoAnn’s amazing homemade apple butter, and recently I started adding fresh cilantro to really brighten and class things up. In addition, I now make these using Finlandia Pepper Jack Cheese. It’s exceptionally creamy and buttery and melts so beautifully inside the tortilla. Plus, it has the perfect amount of jalapeños, giving it tons of flavor and just a subtle amount heat. It’s by no means overwhelming, making these great for adults and kids alike. I promise you don’t have to be three sheets to the wind to enjoy these quesadillas, although having a few beers first certainly won’t hurt. They’re easy, unusual, and totally awesome. I hope you give them a try. Makes 1 quesadilla. Scale up to easily make more. 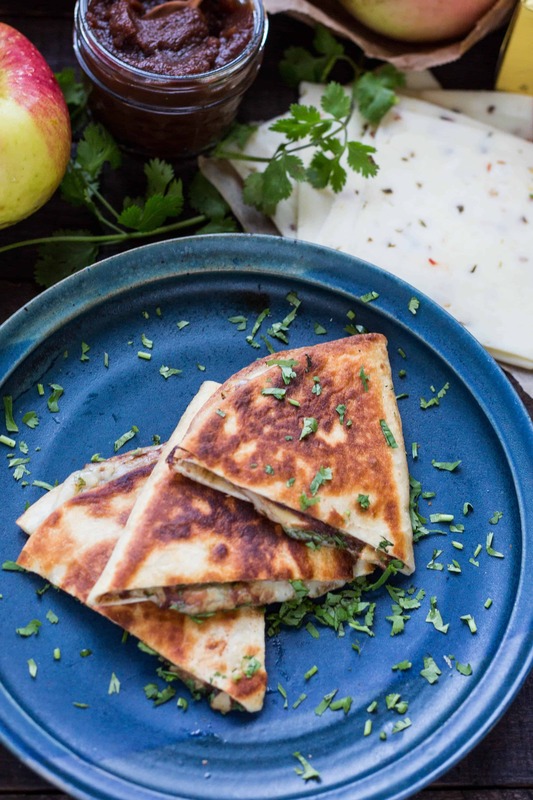 Spread the apple butter around the tortilla, then top with slices of Finlandia pepper jack cheese, then a sprinkle of fresh cilantro. Fold in half to enclose the filling. Melt butter in a medium sauté pan over medium heat. Place the tortilla in the pan and let cook until golden brown and crisp, about 2-3 minutes. Use a spatula to flip over on to the other side and cook for an additional 2-3 minutes. Remove the quesadilla from the pan and place on a cutting board. Slice into wedges and serve immediately. I always think my drunk cooking is super creative and delicious and then I sober up and think… notsomuch. You’ve got skills, Coley! I’m trying these with mango butter and a couple IPAs. Haha, I’m sure it’s better than you think! Then again, after 10+ years of being over the legal drinking age, this is the only recipe I can think of that was remotely worth sharing.